Hurricanes Happen but will the Ike Dike? You Are Here: Home > On the Issues > GDN Columns > Hurricanes Happen but will the Ike Dike? but will the Ike Dike? Bill Sargent, Mark Mansius, and John Gay all ran for Congress in the 2012 Republican Primary. 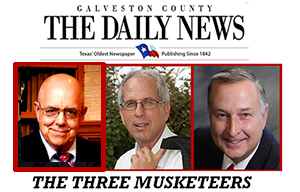 They became friends and have been writing weekly columns for the Galveston County Daily News since May 2013. Forest Gump said… “Hurricanes Happen” or something like that! Hurricanes are a fact of life for those of us who work and live on the coast. Is this just a coastal community issue? We believe the answer is NO! The petrochemical and refinery infrastructure are a key part of our national economic vitality and security. About half of our nation’s oil refining operating capacity resides along the Texas and Louisiana Coast. Overtime practical logistics has driven the location of these facilities to be near oceans and other navigable waterways. After Katrina, national costs of gasoline and other key refining products soared. Why? Traditionally, the 10% rule drives extreme pricing swings in petroleum markets. Simply put, this means that major price swings occur if the difference between production and usage is greater than ten percent for prolonged periods. It’s also true that one of the best future stock market and economic indicators is radical swings in the pricing of petroleum products. Protecting refining capacity and oil production along the Gulf Coast is, therefore, a national issue. The Houston Ship-Channel alone transports half a billion dollars of commerce every day. The people at Rice University have suggested building a dike-gate across the Houston Ship Channel up north some 50 miles inland. Although this would protect part of our region’s infrastructure it would not protect all of it. In addition, communities located along the ship channel like Galveston, Texas City, San Leon, Bacliff, Kemah, and Seabrook and beyond would be left unprotected by the Rice University proposal. However, if an Ike Dike was constructed along Bolivar Peninsula and Galveston Island and flood gates built to cut off the ship channel between the City of Galveston and Port Bolivar during hurricanes more people would be protected and more of our critical industries as well. Add to this the reduced costs of flood insurance for properties in our region and the benefits of having a coastal dike system become very evident. But who will pay for all of this? It’s going to cost billions! The three of us generally oppose earmarking funds for hometown projects but in this instance it’s not about “pork” and building bridges to nowhere, it’s about protecting a national resource. Believe it or not, this IS a national security issue and a Federal one. Our Founders wisely left behind specific powers to the Federal Government with respect to governing interstate commerce and coastal waters. When we protect industries that significantly impact national interests and that are within Federal jurisdiction, there is a Federal responsibility. Additionally, we believe that unlike a lot of things the government is spending borrowed money on these days, building an Ike Dike fits squarely within the Congress’s Constitutional realm. The Congressmen in our region and our Senators should be spearheading the fight to find funds to plan, build, and operate a coastal Ike Dike. There may be those who raise environmental concerns. We don’t want these downplayed. But at the same time we would suggest that having an Ike Dike back in 2008 might have played a major role in protecting the low lands and wetlands in our region from an infusion of salt water.